This was a really interesting trip for us. 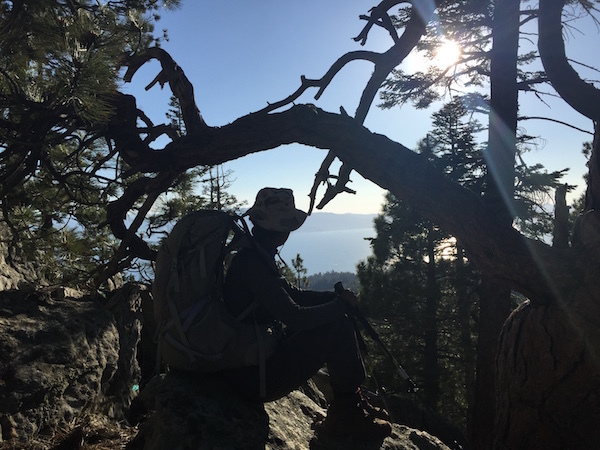 We are planning to hike the Tahoe Rim Trail (TRT) this year, and wanted to check out this area ahead of time. This 4th of July weekend was perfect for that. Plus, on part of TRT you can pretty much camp anywhere, no permit required. The only permit you need is a campfire permit (even with a canister). In previous trips, we used developed campground and packed lots of miles in one day. For this trip, our plan was to practice camping in the wild and do some casual hiking. 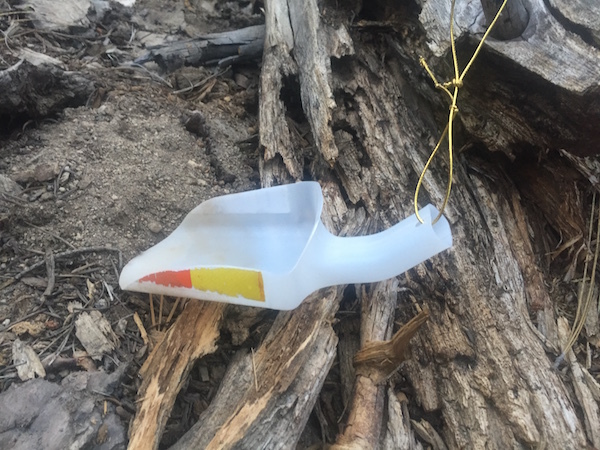 Our two main concerns were: 1. getting used to thinner air; 2. encountering bears, so it was also a good time to practice using our bear canister. 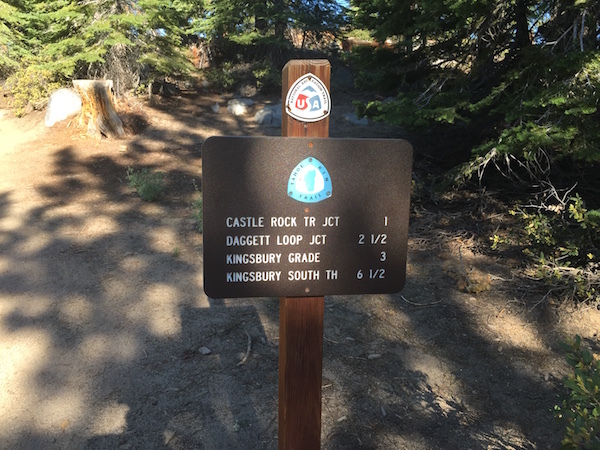 We set off around 10am for TRT Kingsbury North Trailhead, with the hope that we could get there within 4 hours. We downloaded the areas in our Google Maps app, so that we could use them offline. One wrong choice costed us 7 hours on the road: we got onto I-80 without looking at the traffic. Apparently, it was no good to drive on that highway midway over this holiday weekend — everyone seemed to flock into this route around that time, going to Napa or Lake Tahoe, etc. After loads of and loads of traffic, we eventually got to the trailhead around 5:30pm. 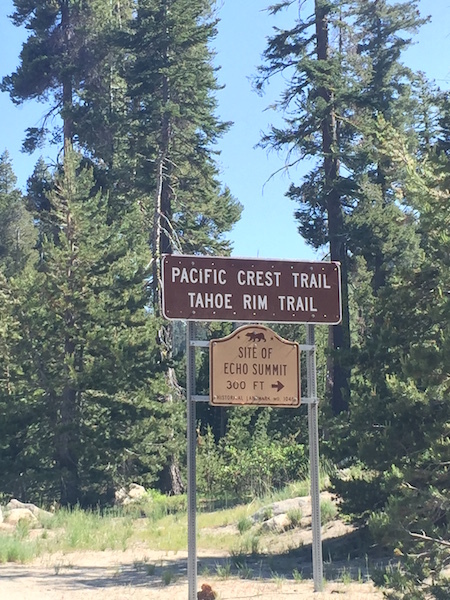 On our way, we passed a sign displaying the merging point of PCT (Pacific Crest Trail) and TRT. The parking lot was small. Since we got there pretty late, there were quite a few openings. The trailhead was about 2-min walk north from the parking lots and very easy to find. I noticed that there were quite a few trails starting from the parking lot, so it is a great hiking place for people living nearby. There were paper maps in the plastic box at the trailhead. No bathroom or trash cans. Walk about 0.5 miles and you’ll reach the TRT direction signs. It was getting late, so we planned to hike to Castle Rock, then found a campsite to call it a day. TRT is a well-maintained trail. 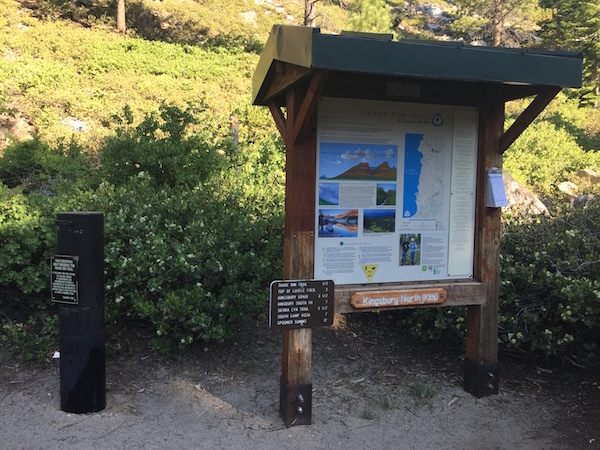 Every once in a while as you hike, you can see light blue signs on the trails indicating directions. It was still very bright around 6pm. We hiked down south to Castle Rock. It was a pretty easy hike and moderate when getting close to the rock. 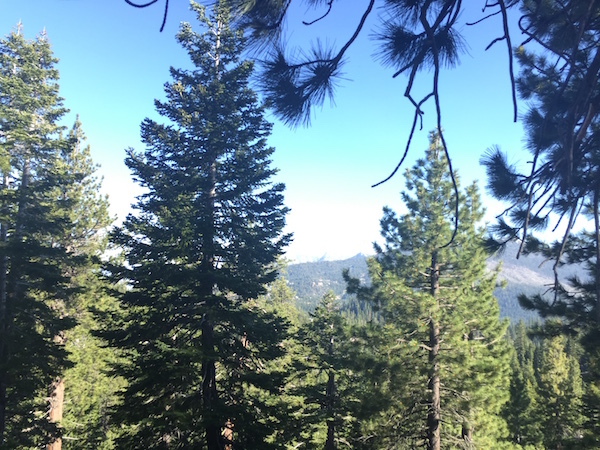 We enjoyed great views of mountain icy tops far away, and the calm big blue Lake Tahoe. Overall, this area is well above 7000 feet. 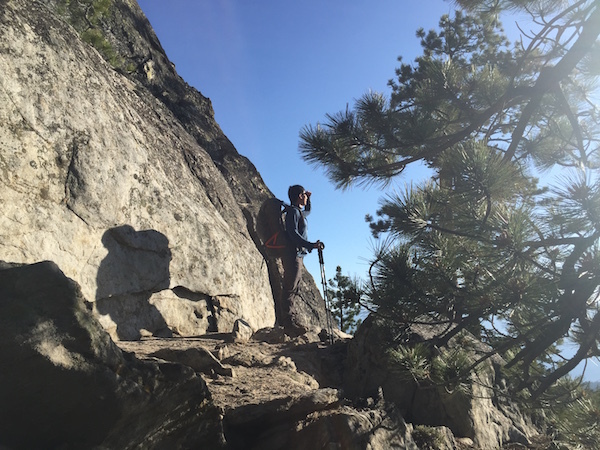 As we hiked, my husband was feeling a bit out of breath, but later he felt fine. I didn’t feel anything in particular. On our way to the rock, we met a couple thru hiking TRT. They started from Kingsbury South and were finishing up their first day. 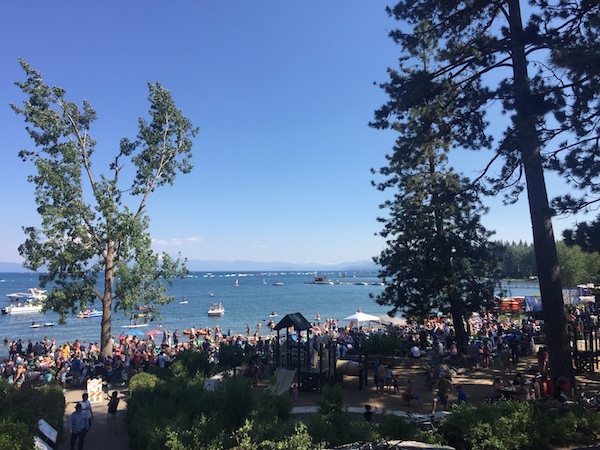 They packed 5-days’ of food and planned to resupply at Tahoe City. They spent an hour earlier to filter water from a seasonal mud pond and creek — the only water source from Kingsbury South. It is true that this section is very dry. They were aware that heavy snow still on top of mountains, but looked like they were confident with that. We wished them good luck and moved on. On our way back from the rock, we met another couple planning to sleep on the rock. They were prepared with some flat floor thingy because there were lots of small rocks everywhere — true. We looked around for an ideal camp site. We wanted to find somewhere flat and with few plants, but the first few places we liked marked as “Area Closed”. It was closed for restoration. We notice HUGE ants on and off trails — they must be really enjoying living here. It’s rare to see such big ants. Not far or close from the trail. We can see hikers in a distance, but still kept our privacy. Plenty of space to separate tent and cooking. Have some big trees around the area but not over your tent. 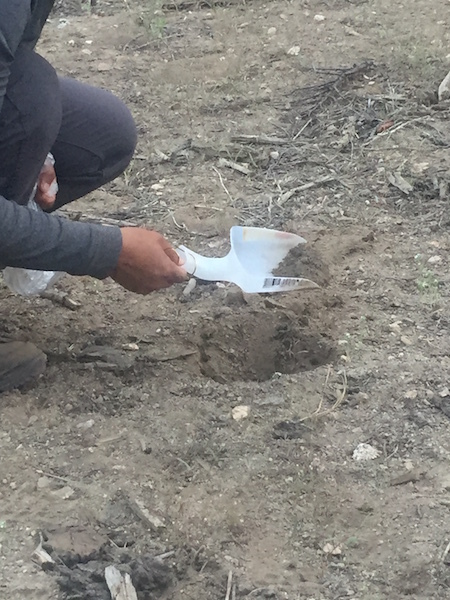 Soil was super soft, easy to pitch tents or dig cat holes. Give it a try if you’d like to find a campsite around there. Speaking of cat holes, we DIYed a shovel and loved it! It was made of an empty Lee Kum Kee Soy Sauce Plastic Container. My brilliant husband did it, it was small, light and very sturdy! After dinner, we got into our tent. We were a bit worried about bears, so we had two hiking poles and a folding knife with us in the tent. How useful? I don’t know. Lots of insects climbed between our tent and the rainfly, making noises. We opened a vent on the rainfly, and quickly the noises were gone. We fell asleep fast after the long day. Somewhere around 4am I woke up and it was dead quiet around. Not a single sound. I had a mysterious feeling that the rest of world gone, only the two of us stayed. Then, I fell asleep again and woke up quite a few times, thinking about bears. I woke up again after 5am, birds started chirping. We heard some really crispy sound from high above, and thought it was a woodpecker. It was pretty much a day of road trip. 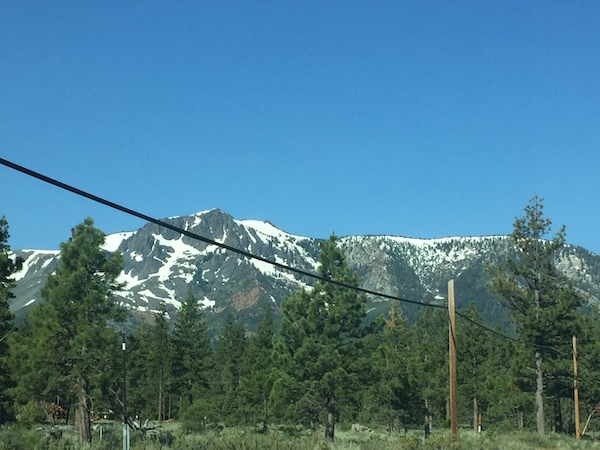 We drove up to Tahoe City to stock some bottled water. 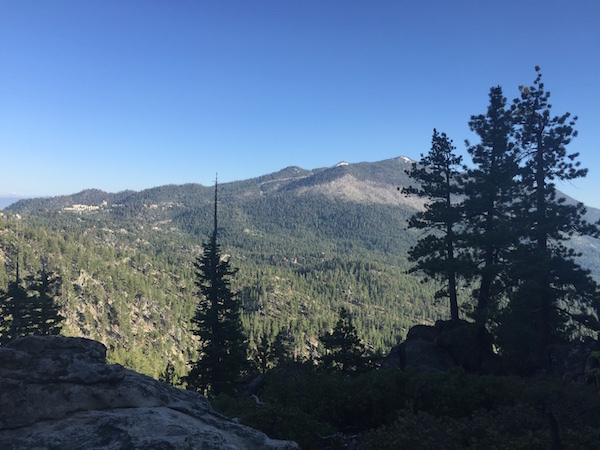 It was getting really sunny and hot around 10am, so we changed our original plan of hiking from the trailhead in Tahoe City, and headed to Reno instead. We saw lots of ice on top of mountains as we drove. Find my impression about Reno in another post. We were planning to stay another night on TRT. After all, camping was free. Just think about the crazy hotel prices during the holiday time. Traffic back to Tahoe City was terrible. 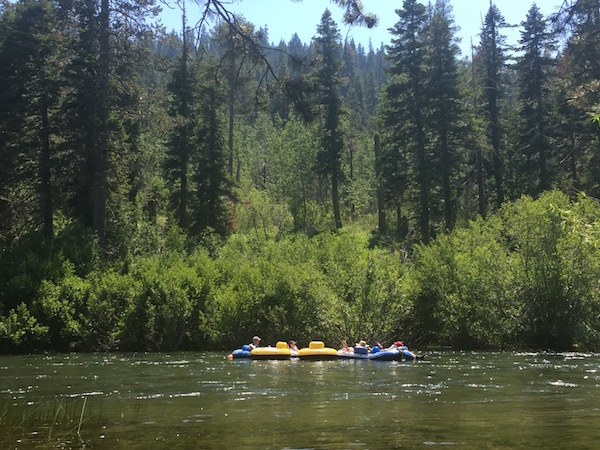 At one point, we parked our car at roadside and watched people rafting. 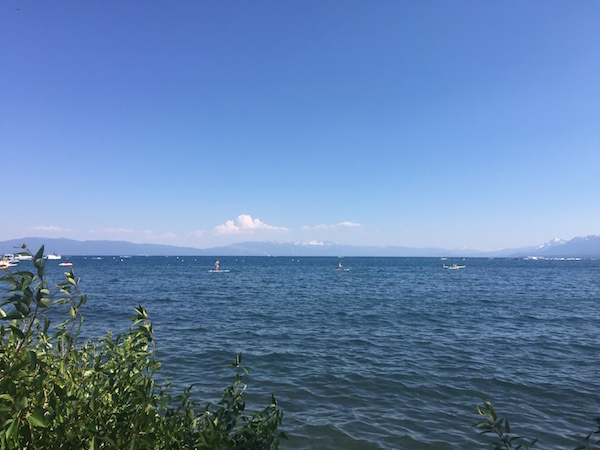 We came back to Tahoe City around 4pm and had a walk around to see the Big Blue closer. There was a park where it seemed everyone came to enjoy a music festival and food trucks. They were all in shorts, T-shirts and some even sunbathing. Looking at ourselves, we were in long pants, long sleeves, sturdy hiking boots and hats. We didn’t belong there. Maybe next time, we should bring some change clothes. 5pm. 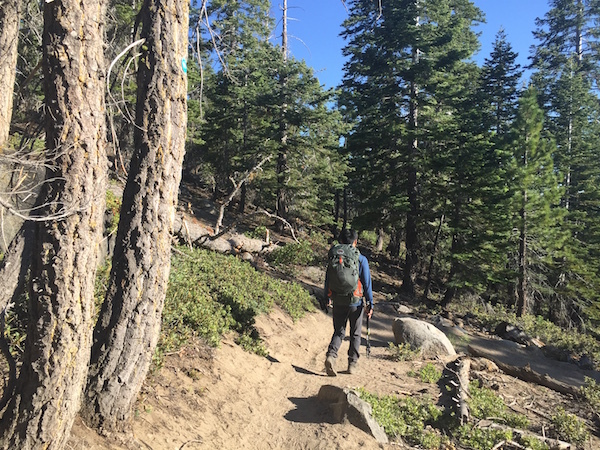 On the way to the trailhead, we were discussing whether we wanted to stay for another night — after all, we did what we came here for: camping in the wild, using bear canisters and digging a cat hole with shovel. 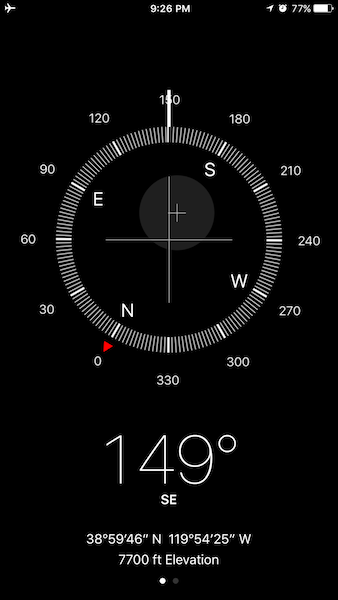 Right before the turn to the trailhead, decision made — we were heading back home. Traffic condition was wonderful in the evening. We grabbed sandwiches on the way, and got home fast.